With the New Year upon us, I think it is always a good idea to analyse not only our life but also our homes and see where we can best make progress into the new year. For myself: ORGANIZATION is always a top priority in the New year. I feel so much more centered and focused when I feel my life and all my possessions (junk) are in some organized and meaningful structure. One of my top New Year's resolutions is to get better organized within my home. I think once you feel an inner calm within your home that this will radiate out to your work, your friends and your entire circle. When you come home each day to a semi-structured and organized existence you are better able to feel an inner calm. You are better able to find your inner "Chi...."
Well first, we must sit back and gain an overall view of where we are and where we want to be. Don't just jump into organizing without a game plan. This will only lead to you being stressed out and feelings of utter despair. A good tip is to start at the top or back of your home. If you have a 2 story house, start upstairs. 1 story? Start in the back rooms and work forward. Kids? No problem. Get them involved and teach them some structure in the process! For the last few days I have been organizing my home. I started with my living room and kitchen. Drawers are my nemesis. Opening drawers and seeing piles of misc items drives me crazy. Best way to deal with drawers is to just pull them out and dump them out! Don't try to organize them with all that junk inside! No! Dump it out! Organize it.... anything that doesn't belong gets pulled out.... trash gets dumped in the trash! About this time... my kids are becoming interested in what I am doing.... Now it is time to work the transition from dread to fun. The ol' Tom Sawyer trick. "What are you doing pop?" Yes... they call me pop! "Oh, I am just organizing my drawers. It is so fun!" I reply. "Can we help?" they chime. "Oh no, I am fine you wouldn't like this type of fun!" And with a malevolent smile I say...."Well do you think you would have fun organizing your rooms?" organizing his drawers and closets. Pants w pants... shirts w shirts... you know the drill! My daughter on the other hand was a hard task! This was also a good opportunity for me to see how much "stuff" I had purchased for her over the years. Trust me... I discovered that we had bought a lot of "stuff" for my 7 year old daughter over the last few years. TOO much! Also... I was beginning to realize that all these "dollar" stores were not really my friend in the battle of frugality yet they had become my nemesis in the whole battle of organizational bliss! Organizing a 7 yr old girl's room can quickly become an exercise in futility so I soon invented a neat little trick. I told my daughter that I would pay her $2 for each trash bag full of clothes, toys, dolls or misc. that she was willing to part with. Man, those toys that she once could not live without, were soon being thrown into a trash bag quicker than she could switch channels from Wizards of Waverly Place to Sponge Bob Square Pants!! O.K. only some of you will understand that reference! I ended up owing her $30 bucks. And, trust me, it was the best $30 I have spent in a long time! So organizing our homes can be a daunting task! When we finally do decide to purge out the old.... it is imperative that you just go for it! It may be hard to get rid of the "stuff" in the beginning but by the end of the day you are just whizzing through it and throwing stuff away or placing items in bags for donations like nobody's business! When organizing drawers or items in a closet; The best and easiest method is to just pull everything out of the drawer or closet right from the start! Don't even bother trying to organize a drawer with all the items inside. This rapidly becomes tedious and frustrating! Just empty out all the drawers... then put the items back that you truly need in a proper organized way and everything left over can go straight into the trash. Yes, even those Christmas items you received over 2 years ago that you have never used, can go in the bin. The philosophy you want to go with is this: If you haven't used "said" item in over a year... just get rid of it! Why keep "shhhtuff" that you may use one day in the future? No, live for today! Today you want to be organized! Today you want to be happy! So if one day in 5 years you want that nutcracker or that odd looking pot holder....oh well.... you have lived 5 years without it and you can buy a new one for a dollar. Right? 5 years of organized bliss is worth way more than a dollar, right? So I have now organized my entire home! I am exhausted... my kids no longer see the thrill in organizing... but guess what? I feel great! I know where everything is, I have purged huge amounts of useless items, and I know where my screwdrivers are! It's the little things that make us happy! 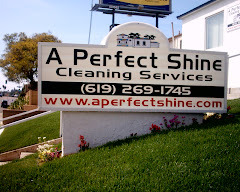 Now it is time to call A Perfect Shine to clean the home and have all the nooks and crannies of my home scrubbed. Then, my friend, this 2012 will definitely start out on a very positive foot! Happy New Year to all. I hope 2012 is not only positive and prosperous... but organized, meaningful and inspirational as well!